John Wesley Wright, deshi (direct student) of Bennie “Zip” Young Hanshi and Head Instructor of the University of Martial Arts and Sciences Goju Ryu System. John has been studying under the direct tutelage Young Kyoshi for 5 years. John has also studied various martial art systems. 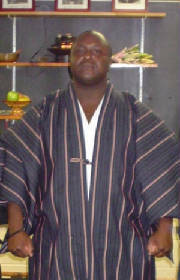 John is also a member of Aiki Kan Preservation Society, founded and directed by Carey Rossignol, Hanshi Shodai.